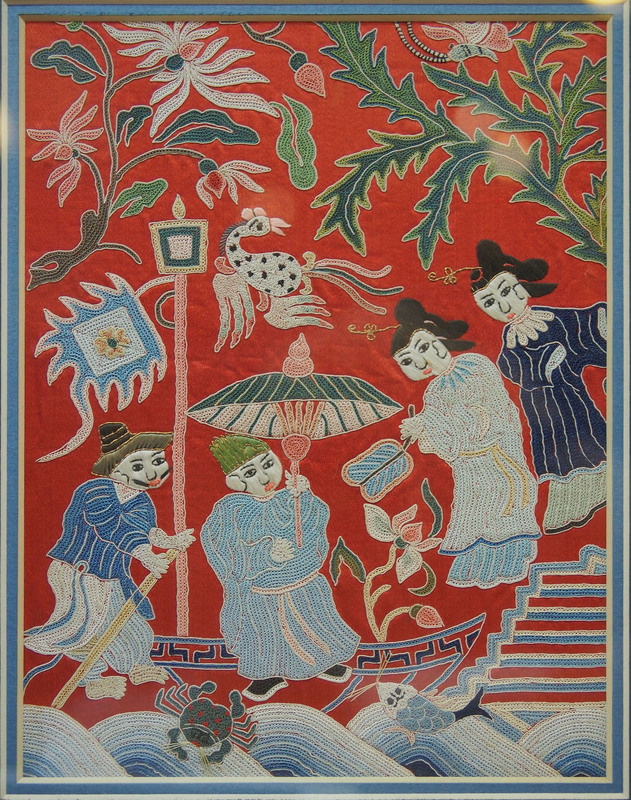 This embroidery captured a scene from the legend Madame White Snake, the novel Jing Shi Tong Yan from the late Ming dynasty. The story was set in the West Lake of Hang Zhou in the period of the Sung dynasty. The serpent spirit of the white snake and her friend green fish subordinate transformed themselves into 2 pretty girls; Bai (white) Su Zhen and Qing Qing (green). Bai fell in love with the Xu Xian and used her magical power got married to him. As time goes by, many strange incident happened because of Bai and Qing. Xu Xian was approached by monk Fa Hai who told him the truth about his wife being a serpent spirit and gave him a monk’s bowl. As Xu Xian place the bowl over his wife’s head, Bai and Qing returned to their original selves. Monk Fa Hai took the bowl with the two spirits and build a Lei Feng pagoda on top of them. A more romantic story has been adapted for opera, movies where the true love of the white snake is celebrated and the monk became a busybody. To see the same scene as the embroidery, go 10 minutes into the movie. As for the Lei Feng pagoda, it was believed that the brick used for building the pagoda has the power of healing, people began to steal the brick, grind it into powder and use it for medicine. 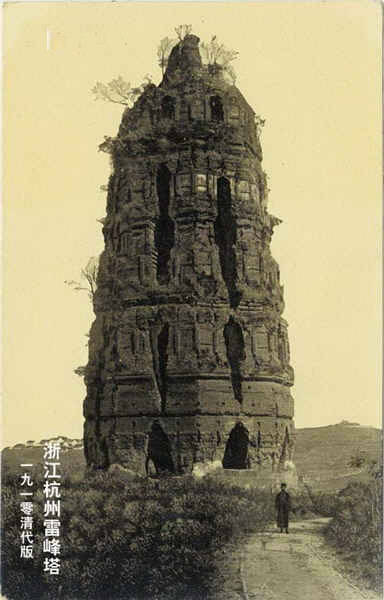 950 year later in 1924, the pagoda fell under its own weight … wonder if the white snake and the green fish manage to escape. A new pagoda was rebuild in 2002.